Roy Fox Lichtenstein (October 27, 1923 – September 29, 1997) was one of the most prominent American pop artists. During the 1960s, along with Andy Warhol, Jasper Johns, and James Rosenquist among others, he became a leading figure in the new art movement. His work early in his career was influenced by the advertising industry and became popular in its ever fascinating comic book style. He always referred to Pop as much more “Industrial Art” than American. His early works Whaam! and Drowning Girl are generally regarded as Lichtenstein’s most famous works,although the piece that has fetched the most money is Masterpiece, which was sold for $165 million in January 2017! Roy Lichtenstein was born in New York into an upper-middle-class, Jewish family and he grew up in New York City’s Upper West Side. He attended public schools until 12 years old then went on to attend and graduating from New York’s Dwight School in 1940. Lichtenstein left New York in 1940 to attend Ohio University to pursue a degree in Fine Arts. In 1943 his studies were put on hold for three years to serve in the Army during World War II, serving as a draftsman and artist. He would return to Ohio State in 1946 and received his Masters in Fine Arts in 1949.It was in this same year he would marry his first wife Isabel Wilson, and they had two sons, David in 1954 and Mitchell in 1956. It was in 1960 when he started to teach at Rutgers University, where Lichtenstein began his first works in the Pop Art Movement. In 1961 he began using cartoon images and techniques from the commercial printing industry and in 1965 he created Look Mickey, which featured the artists use of hard edge figures and Ben-Day dots. It is rumored that Lichtenstein created the piece after being challenged by his sons who saw a picture of Mickey Mouse in a comic book. In 1961 he started to feature his works at Leo Castilli’s studio in New York, and 1962 at his first one man show, his works were sold out by prominent collectors before the show even opened. In 1964 Lichtenstein resigned from Rutgers University to focus on his growing career in art and he decided to move back to New York. He would marry his second wife Dorothy Herzka in 1968, and he began splitting his time between his studio in New York and the seclusion and solitude of his home in Southhampton. 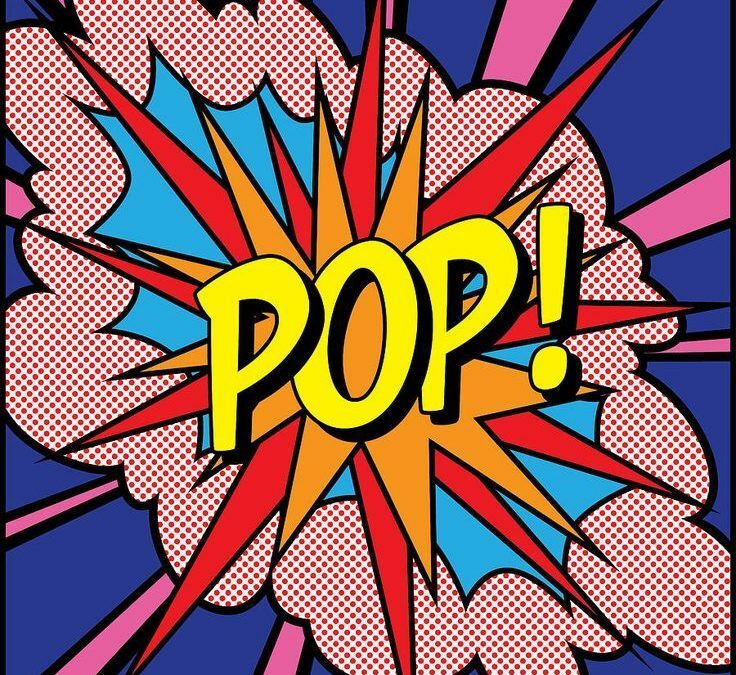 Arguably his most famous piece is Whaam!, and is one of the first known examples of American Pop. It was created from the comic book artist Irv Novick’s comic book panel 1962 issue of DC Comics. Its use of colors and lettering and the depiction of the American fighter jet firing a rocket into the enemy plane, captures the essence and style Lichtenstein developed in this time. He would continue art into his old age until he passed away in 1997 of pneumonia at the New York University Medical Center. He is survived by his second Wife Dorothy and his sons from his first marriage. October – Join the for the Halloween spirit at the Hillsdale Shopping Center in San Mateo on Halloween for an afternoon of activities and fun for children of all ages. Parade in costumes, join in the slime making with Mad Science of the Bay Area, or make spooky crafts and cookies. The free event is from 4-5:30PM, trick or treating takes place between 4-5PM. For more information visit here. November – Come bring the family and friends to the free first Friday at the San Mateo County Museum. Kids have a blast with fun music and craft learning experiences and activities for kids to participate in throughout the day. Located within the historic “Old Courthouse” in Redwood City and features dozen of exhibits related to the use of natural resources, suburban development, ethnic experience and entrepreneurial achievement on the Peninsula from the time of the Costanoan Indian through today. For more information visit their website at here.